After the American Legislative Exchange Council (ALEC) hosted a well-known bigot for a keynote speech, a coalition of 80 organizations pushed four Fortune 100 companies out of the lobbying group. Back in August, at its largest annual conference of corporate lobbyists and state legislators, the American Legislative Exchange Council (ALEC) made a dumb mistake. That mistake was inviting a well-known practitioner of hate speech and slander – David Horowitz – to give a keynote speech. Horowitz did his thing, and insulted female celebrities, Black Lives Matter, and Muslim people. ALEC’s audience laughed at his bigoted commentary. Our friends at Common Cause noticed the speech and rallied allies to craft a coalition letter to express concern to 21 of ALEC’s known corporate members. 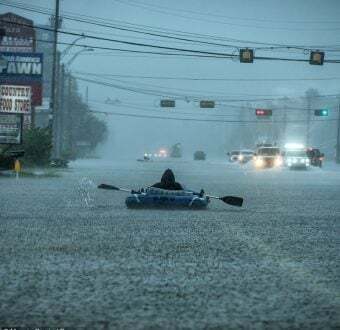 Greenpeace joined the effort, which grew to 80 organizations, including Public Citizen, Color of Change, UnKoch My Campus, the Sierra Club, Presente, Make the Road NY, OneAmerica, and dozens of other groups. Not long after, ALEC went into damage control mode (see ALEC’s first attempt, followed by a full-blown condemnation of Horowitz). Things continued to escalate as the story was picked up by the Southern Poverty Law Center, one of the nation’s longstanding authorities on monitoring and countering hate speech. Verizon and AT&T both confirmed on record that the Horowitz speech is the reason they chose to leave ALEC. Diageo, which owns alcoholic beverage brands like Guinness, Crown Royal, and Captain Morgan, confirmed that it had previously discontinued its ALEC membership, before receiving the coalition letter. 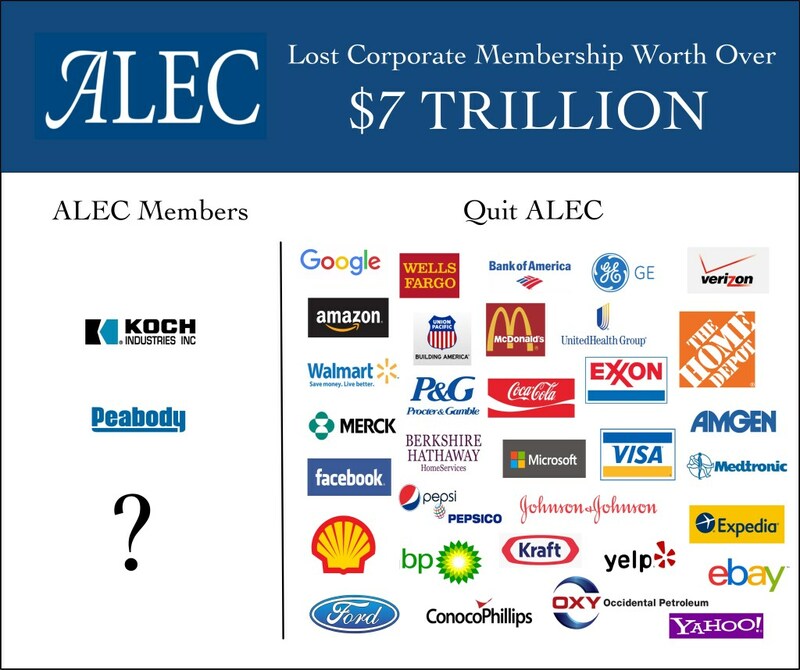 Most companies that have dumped ALEC are massive: combined, the companies ALEC has said goodbye to are worth over $7 Trillion in market capital. 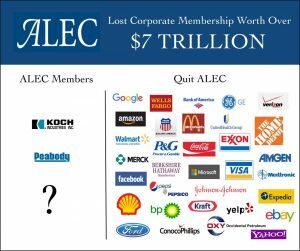 Charles Koch and Koch Industries are stepping in to fill the void left by other corporations, as ALEC loses income from their membership dues. In fact, Charles Koch’s foundation alone provided 7.2% of ALEC’s budget in 2017, despite ALEC’s longstanding claim that “No one individual or organization makes up more than two percent of ALEC’s budget.” This 7.2% does not include additional membership fees paid by Koch Industries, and by Americans for Prosperity, Mr. Koch’s primary political advocacy group. A designated executive from Koch Industries (most recently, Michael Morgan) has been a consistent member of ALEC’s corporate board of directors for decades. Koch Industries gave ALEC a bailout loan during financial trouble in the late 1990’s. 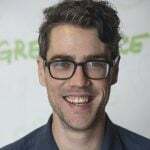 ALEC recently hired a former Koch Institute and Americans for Prosperity staffer named Grant Kidwell to manage the ALEC Energy, Environment, and Agriculture task force. Other dirty energy companies that have stuck with ALEC include Peabody Energy, Duke Energy, Chevron, Dominion Resources, Marathon Petroleum, and industry lobbying groups like the American Petroleum Institute and the Edison Electric Institute. The Intercept has all of the details, including data shared by Greenpeace on increased Koch funding to ALEC disclosed in freshly-released 2017 tax filings.